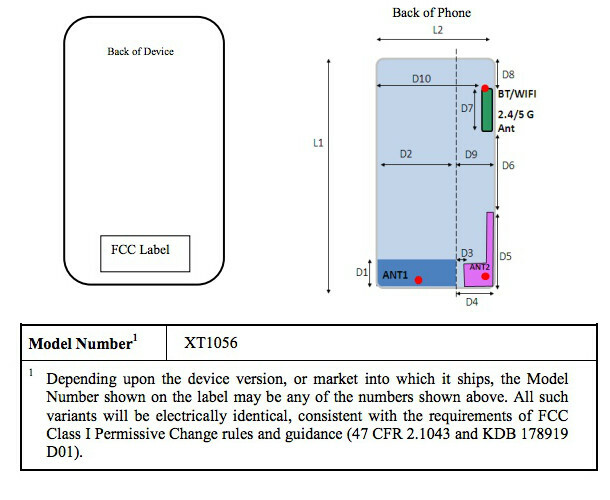 The Motorola XT1056 stopped by the FCC this week sporting Sprint’s LTE band. If we were betting men, we’d be willing to bet that this is likely the Sprint version of the “XFON” that has been spotted a number of times on its way to AT&T in both benchmarks and in pictures. The model number for AT&Ts version is XT1058, so XT1056 certainly matches up to the model number scheme, especially if the XT1060 that we reported yesterday is indeed Verizon’s variant. The XFON has been pretty heavily scrutinized over the last couple of weeks by readers as details for it emerge. The device looks to be sporting a 720p display and low-end dual-core Snapdragon S4 processor, while the rest of the smartphone game is running quad-core Snapdragon 600 chipsets and 1080p displays. Maybe this is the last of the devices in Motorola’s pipeline that aren’t “wow” by Google’s CFO’s standards? Or maybe Motorola has some extra tricks up their sleeves that will try and prove that top-of-the-line displays and processors don’t make a smartphone great? We will certainly be curious to see what this new smartphone of Moto’s turns out to be, as we are all wanting Motorola to make another comeback. With HTC apparently in turmoil and Samsung continuing to grow, we need another contender.